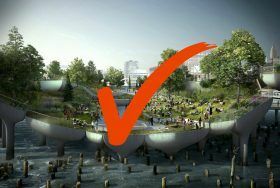 Back in July 6sqft reported construction progress at the enthusiastically on-again Pier 55 public park project on the Hudson River funded by billionaire businessman Barry Diller. The park broke ground in April, and some snaps courtesy of CityRealty revealed new concrete pylons arranged in various heights that will act as the wave-shaped floating park’s support structure. Now, the New York Times details further and more fascinating progress on the $250 million park and performing arts venue, including the installation of its stylistic anchor in the form of a system of concrete supports called pots, the underpinnings of Diller’s unconventional architectural vision. And CityRealty once again reveals photos of what’s happening in the Hudson just west of the Meatpacking District. 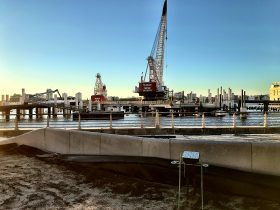 Construction has moved along quite nicely at Pier 55, the on-again, off-again public park project funded by billionaire businessman Barry Diller planned for the Hudson River. While there was not much to show when the park broke ground in April, photos recently taken by CityRealty reveal new concrete pylons arranged in various heights. These will act as the wave-shaped floating park’s support structure. After years of drama, during which the project was declared dead, then given new life, construction on the public park anchored in the Hudson River (also known as Pier 55 and Diller Island), is now moving forward as evidenced by a site photo taken by CityRealty this week showing two walkways leading to the pier from Hudson River Park now in place. As 6sqft reported last October, the Pier 55 project spearheaded by media mogul Barry Diller was rebooted with Diller’s renewed commitment, complete with the backing of his recent legal foes, former ointment-fly Douglas Durst and Governor Andrew Cuomo. 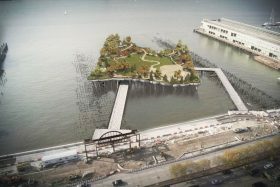 Manhattan Borough President Gale Brewer appointed Douglas Durst on Friday to the board of the Hudson River Park Trust, a group he has frequently criticized over their proposed Pier55 project. 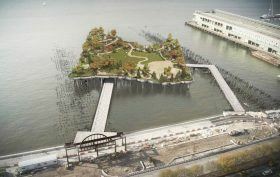 Durst admitted last year to funding a lawsuit to stop the trust’s plan for an off-shore park on the Hudson River. While billionaire businessman Barry Diller, who is funding the $250 million project, halted construction in September, the plan was restored a month later, with pressure and financial help from Gov. Andrew Cuomo. Brewer told Crain’s that Durst didn’t volunteer, she asked him to join the board. “I think he loves the park,” she said. 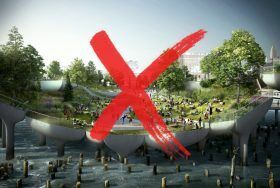 Barry Diller, the billionaire chairman of IAC, announced he’s killing the $250 million project that promised to bring a futuristic offshore park and cultural site to the Hudson River’s dilapidated Pier 54. 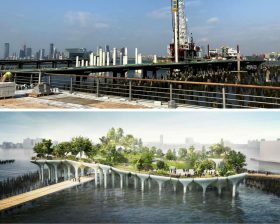 6sqft previously covered the unfolding saga of the ill-fated project, known as Pier 55 (or sometimes as “Diller Park”), as opposing factions continually blocked its progress and were eventually revealed to be funded by prominent New York real estate developer Douglas Durst. According to the New York Times, Diller said Wednesday that his commitment to build the undulating pier would be coming to an end—an inglorious one for a bold plan that some, and certainly Diller himself, saw as a new Manhattan waterfront icon to rival the nearby High Line. Photo via Pier 55 Inc.
6sqft reported in March on the latest developments in the on-again-off-again status of the $200 million Barry Diller-funded offshore park/performing arts center proposed for Pier 55 on the Hudson River; though construction began last November, opponents of the project, led by the City Club of New York, gained a victory in the form of a ruling by Judge Lorna G. Schofield that agreed with group’s claim that the Army Corps of Engineers had not conducted a sufficient environmental review on how the 2.4-acre park would affect fish and wildlife. 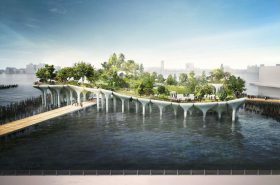 The judge ordered that work stop at the site and called for a review of alternatives for building along Hudson River Park, a maritime sanctuary. Now, the New York Times reports that the Corps of Engineers, with the project’s sponsor, the Hudson River Park Trust, has filed an appeal of the decision. If you thought the roller coaster that is Pier 55 was over since construction began in November, you may not want to step off the ride just yet. Just yesterday, a federal judge ruled in favor of the City Club of New York, who took legal action against the $200 million Barry Diller-funded offshore park way back in the summer of 2015. As reported by the Times, Judge Lorna G. Schofield agreed with the group’s claim that the Army Corps of Engineers had not conducted a sufficient environmental review on how the 2.4-acre park would affect fish and wildlife. She ordered that work stop at the site and called for a review of alternatives for building along Hudson River Park, a maritime sanctuary.